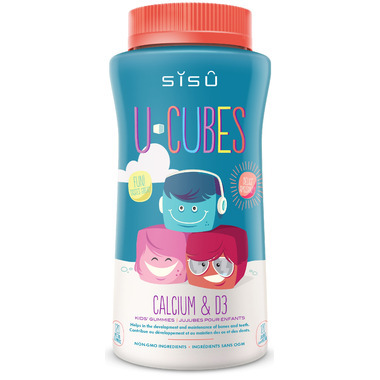 SISU U-Cubes Calcium and D3 Gummies are specially crafted for children as a daily calcium and vitamin D supplement and a sweet tasting treat. These gummies are made with all natural flavours and sweetners, while providing essential nutrients for growing bodies and minds to help them reach their full potential. Dosage: Children (4-9 year): Chew 2 gummies 1 time per day. Children (9-13): Chew 4 gummies 1 time per day. For me the ingredients in vitamins are really important because you want to help your body with extra vitamins, but on the other hand you poison it with chemicals and other additives found in most pills. These vitamins are clean and I found they do help especially when the kids go through a rapid growth spurt. Love the ingredients in this and it tastes great. My kids love this one. These taste so good and my toddler loves them! My kids love all the sisu products! My children absolutely love these... and secretly so does mom. Easy way to get vitamins into my two little boys! Worth the purchase. My two year old loves them. I feel good about the ingredients, a lot better product than many of the kids vitamins on the shelf. Very pleased with these gummies! He can't wait to eat them every morning! I'm Using these to supplement extra calcium for a little boy who teethes very hard! Hoping for a smoother teething bout this time! My daughter is dairy free and we live these calcium gummies. My 3 yr old and 5 year old have both been taking them daily for about a year now. Airways excited to take them. My little one has a dairy allergy so I'm always looking for options for calcium supplements. These are fantastic and the taste great. He loves them! My kids love taking these. Shh...so do I! Yummy! My kids love these and have been taking them without an issue for a couple years now. I love that they have no artificial sweeteners or colours and are all-natural. My kids are excited to see which flavour(s) they've gotten!! Couldn't get my four year old to take any other type of calcium supplement, but he loves these! My picky eater son loves these and I never have to force him to eat these. I do have to with other calcium tabs.